Jackie Fo: Roaring Twenties Party Inspiration! You guys! Can we talk about how excited I am for my good friend Hillary's 30th birthday party? While I'm of course excited that she is joining the 30 club with me, I'm simply thrilled that she had the fabulous idea to have a"Roaring our of her Twenties" party to celebrate turning 30. Get it... a Roaring 20s party? Obsessed. Although I wasn't around for the actual '20s (duh), I gather that the decade was chock full of glitz, glam and fancy cocktails. Um sign me up?! 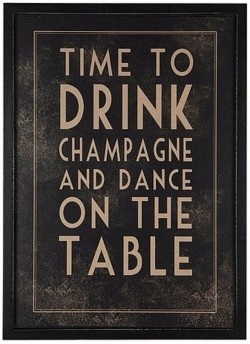 Who needs modern day conveniences when you have champagne a-flowin' at all times? 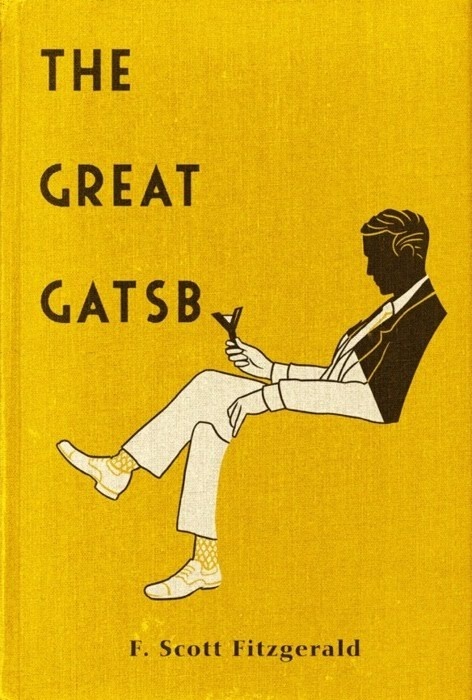 When I think of the roaring 20s I think of my favorite book, The Great Gatsby, which I've read countless times. In fact, I think it's due for another read. I should get on it before the new movie comes out. 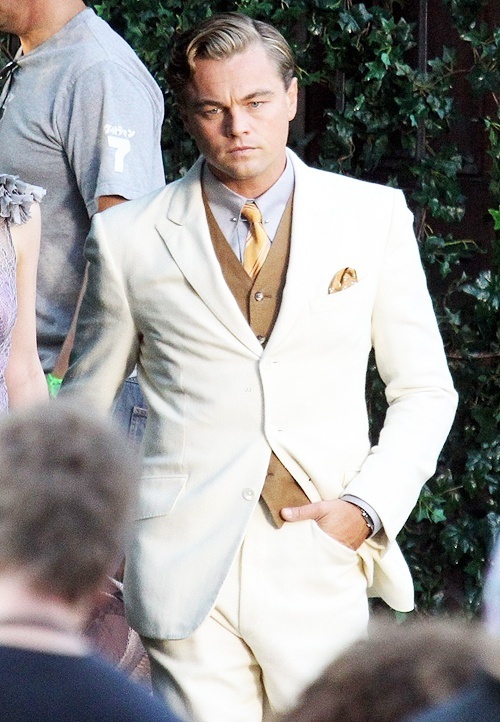 Leo as Gatsby? Sold. Romeo and Juliet, Titanic and Gatsby? I think it's been proven that Leo can do no wrong in the cinema. 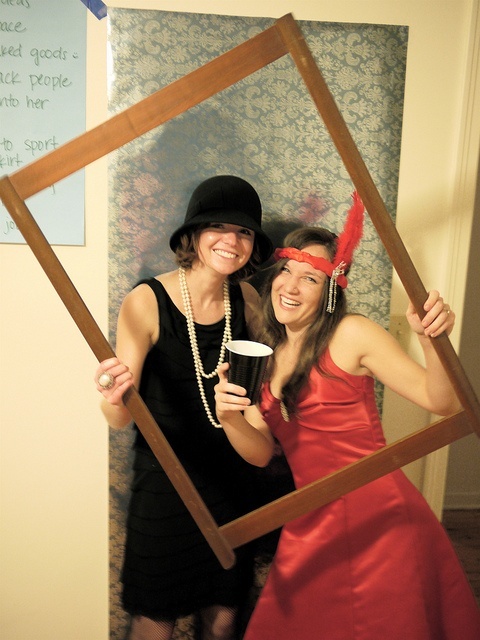 Let's peruse some '20s party ideas, shall we? This girl is having fun with her fabulous flapper look and fun cocktail in hand. Check out this bar set-up....Prohibition whaaaat? This party really nailed it with a homemade photo booth. I'm loving the girls long pearls on the left. 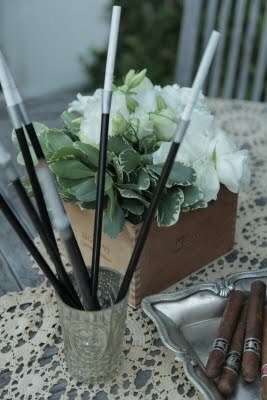 If I smoked I would use these long cigarette holder thingies to look cool. Fo sho. 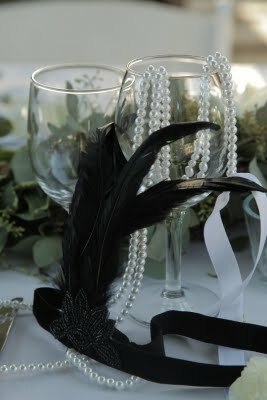 Pearls and feathers are a must for party decor. 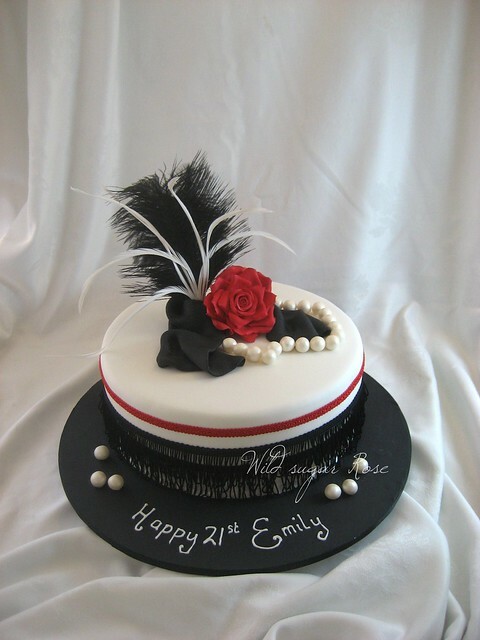 I adore this flapper cake...the fringe on the side is amazing! I love the framed vintage photos on the black table runner for this setup. 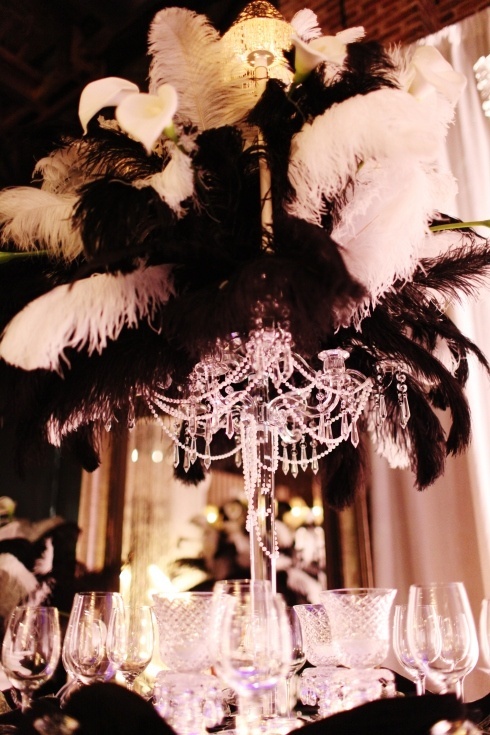 This grandiose feather centerpiece is ridonk. It really sets the scene for glamour, if you will. 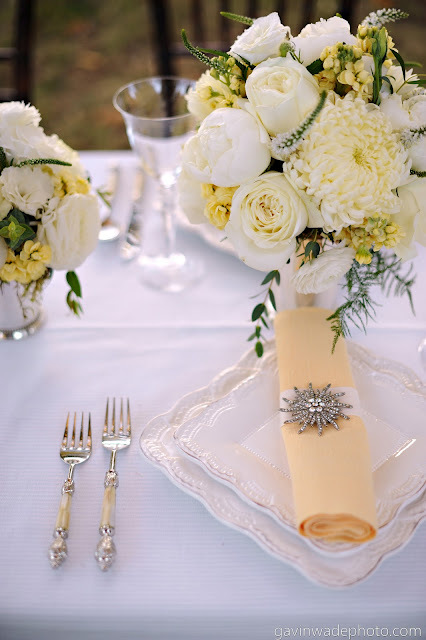 I also love the idea of using vintage brooches for napkin rings. The party will clearly be a costume party, as if I even needed to say that. I'm super into this feather headpiece. And side note, the girl looks badass with her tattoo, doesn't she? A tattooed flapper...bet the 20s never saw that. I'm going to find a glittery flapper dress to wear for the party. Something like this. Have a glitzy, glamorous day! I love this party theme. 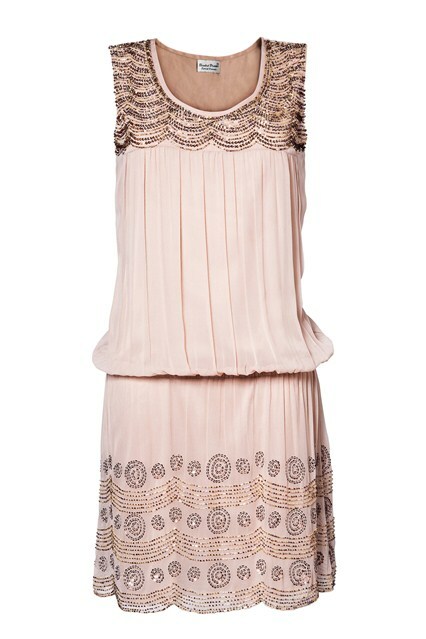 I need an excuse to dress like a flapper. Also, I really want to see my husband in that white suit Leo's wearing. That's a good look. Fantastic inspiration! 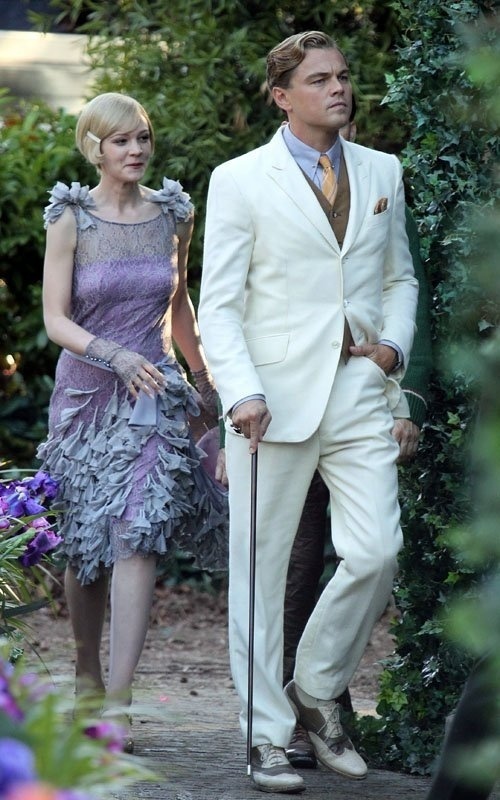 And how did I not know there was a Great Gatsby movie coming out? Totally sold. awesome theme, can't wait to see what you do! I was really pleased with my party here. I would be the perfect person to have on an infomercial for this place if they ever had one. Ha! I highly recommend these guys.